Currently studying for his Master’s in Data Analytics at the National College of Ireland, Sujay Viswanathapalli shares his most memorable moments from his first month in Ireland. From Irish humour, to feeding horses and dancing, this is one trip he’ll never forget! Just like you see in the movies, I arrived in Ireland full of emotions and personal ambitions, and not knowing what to expect! My first encounter with Irish humour took place just fifteen minutes after I arrived in this land of fun! Tony, is our college taxi driver, and he came to collect me from the airport to drive me to my new home. It was a beautiful sunny day so I said to him “I love this climate” and he, in no time, responded “pray to god with all your strength, so that it remains same after ten minutes!”. The weather is unpredictable here! NCI had arranged host family accommodation for my first two weeks in Ireland. I was a bit nervous about living with an Irish family, and I had in my head that I would move out as soon as possible to my own ‘bachelor pad’. After the two weeks were up, the family asked me if I would like to live with them for longer. They are so nice and welcoming, and now I never want to move out! I consider myself so lucky to be a part of their family, and living with them helps me to deal with being so far away from my parents and the inevitable homesickness. Mrs. Bernie Darcy, is the head of the house where I live, and she has taken me all around Dublin, and further afield. Our trip to Athlone and Roscommon, was one of the best holidays I have ever had – exotic and picturesque is all I can say about it! Believe me guys, Ireland has got one of the best countrysides in the world. It all started in Athlone by feeding Jack and Jill (pictured above) in the morning. “No no, Don’t call them horses, they won’t respond”, said my little Irish brother from another mother, Aaron. 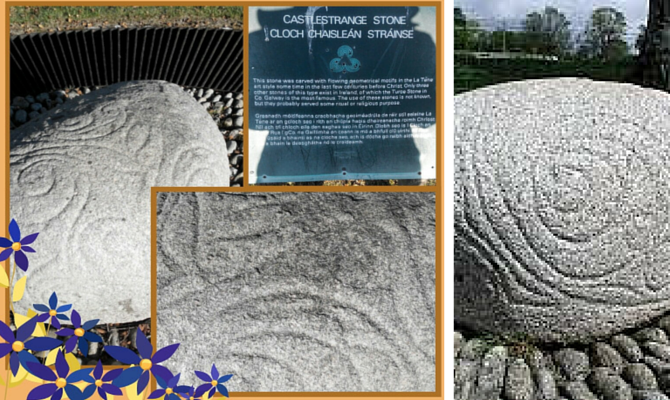 Later, we visited few old, impressive castles in Roscommon, and Mrs. Darcy took us to a place called Castlestrange Estate where I found a really interesting monument (pictured below). This stone belongs to the Iron Age and was carved sometime around 500 BC! Amazing! We had a fabulous holiday visiting beautiful and historic places, and this was just one, out of many exuberant days, that I have enjoyed in Ireland. The list of great experiences just gets longer with each day that I spend here. Another memorable day worth sharing was the NCI International Student Event. It was organised by the NCI International Office especially to introduce Irish culture to study abroad students, and included traditional Irish music and dance. Sheila Mahon, our International Officer, is an incredibly innovative and active person, and she is always outstanding in arranging this type of fun stuff for us! There were loads of interesting things happening throughout the day, but personally, I fell in love with the Irish traditional music, something that is at the very heart of Irish culture. I would describe it as ‘mood-boosting’, and I challenge you to listen without tapping your feet! We also practiced Irish dancing, which was great fun, and I’m really looking forward to the next event! From day one, Ireland has given me some of the best moments of my life. Trust me guys, Ireland is great! So, what are you waiting for? Come study in Ireland! With CGPA of 7.8 during my B tech ( Comp Sc), and around 6+ years of IT expereince do I stand a chance to be selected for MSc?masters in Data Analytic in any of the Irish college ?